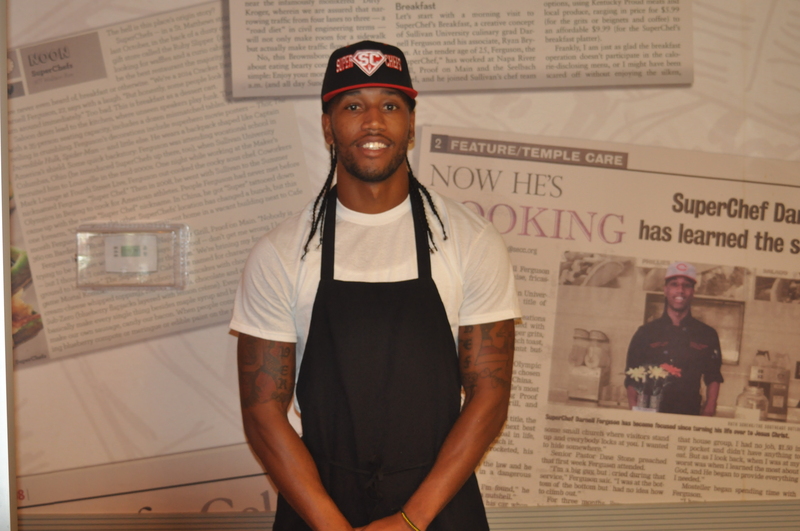 Darnell Ferguson’s newest iteration of his SuperChefs concept has been serving breakfast and lunch for several months at 1702 Bardstown Rd., and now he has gotten all his ducks in a row, so to speak, and has started serving dinner. That is, DINNER is now serving dinner. The change in the name denotes a daily overhaul of the decor as well as the menu. The super heroes that bedeck the walls and inspire the menu names during the day are replaced with images of super villains, and their names denote the dinner choices on the menu. The Henchmen are the appetizers: a southern egg roll, made with mac and cheese and fried chicken; grilled oysters; crab cake lollipops; lamb chop lollipops ($4 each); and the Firefighter Travis, a cornbread waffle sandwich with chicken, mac and cheese and greens. The entrées celebrate The Riddler, with meatloaf cupcakes “iced” with mashed potatoes; Harley Quinn, with ribs in a Sprite and agave BBQ sauce; and Dr. Doom, with a smoked shrimp gumbo, among other dishes. Green salads are from the Kryptonite section of the menu, and Partners in Crime are the side dishes, such as greens, fries, fried corn on the cob and soy-glazed Brussels sprouts. DINNER hours are 5-11 p.m., Wednesday through Saturday. Happy Hour is 5-6:30 p.m. every day but Saturday.